This 4-in-1 electronic cam lock from the Codelocks NANO90 series makes an excellent addition to offices, schools, warehouses, houses and many other locations that could benefit from a compartment with a lock. It’s sleek and compact appearance make it ideal for tight fits. It’s a great option for small lockers, furniture cupboards, medical cabinets, safes and charging lockers. The KL90-LH operates using a single CR2450 battery which will last up to 100,000 operations. 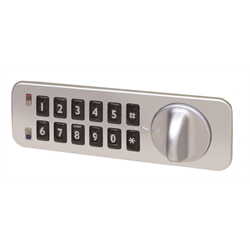 It’s 12 button keypad allows for up to 4 code levels for additional levels of security.